Kingston, Ontario is a Canadian city located in the eastern portion of Southern Ontario, where Lake Ontario flows into the St. Lawrence River and the Thousand Islands begin. Kingston is the county seat of Frontenac County. According to the 2006 Canadian census, the population of the city proper was 117,207, while the population of the metropolitan area was 152,358. 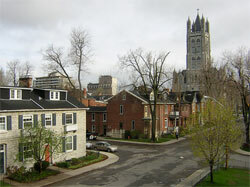 Kingston is nicknamed the "Limestone City" because of the many historic buildings built from the local limestone. Kingston's economy relies heavily on public sector institutions and establishments. The most important sectors are related to health care, education (Queen's University and the Royal Military College of Canada), government (including the military and correctional services), tourism and culture. Manufacturing, and research and development play a smaller role although they played a larger role in the past. One of Kingston's major industrial employers of the 20th century, the Canadian Locomotive Company, closed in 1969, and the former Alcan and DuPont operations employ far fewer people than in the past. A wind farm, the Wolfe Island Wind Project opened in June 2009. The wind farm starts a new trend by creating green jobs. From Wikipedia, the free encyclopedia.